The Aegean Plaza is located in Kamari, just 70meters from the black sandy beach. 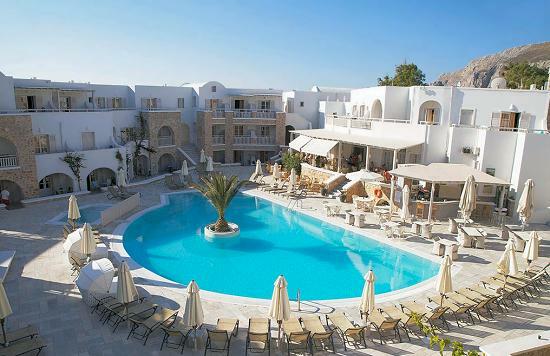 It combines the traditional and unique Cycladic architecture with modern facilities. It consists of 30rooms, 10studios and 20 luxury suites. All rooms have direct dial phone, mini-bar, air-conditioning (heat & cold), 3 channels of music, satellite TV, private safety deposit box, hair-dryer, marble bathroom, balcony or terrace with view to the pool. The studios also feature a fully equipped kitchenette. Hotel’s facilities include an elegant and spacious lobby with satellite TV, a restaurant viewing the sweet water swimming pool, a children pool, a main bar and a pool/snack bar, 24 hours reception, room service, laundry, secretarial service, money exchange, post service, internet access, baby-sitting, gym centre, sauna.